One of my all time favorite past times is to dig through the many boxes of my families old treasures. My great grandmother, Edith, left my grandmother, Dee Dee, one of her fondest treasures: her recipe tin. Recipe tins were so intimate then. They were filled with personal notes from friends or admired cooks, scribbled on napkins or corners of torn paper, signed with hearts and nicknames. Half of the time I can't even read the ancient cursive that bleeds through the tissue paper, but every couple of recipes I come across a highly saturated textured advertisement from a newspaper or magazine that makes me confused, hungry, and full of laughter all at once. It's hilarious, but also really interesting, to see how food styling and design has changed overtime. No, sadly, these aren't all actually from Edith's recipe tin, but she inspired me to dig through old recipes and advertisements and find their more modern counterparts. 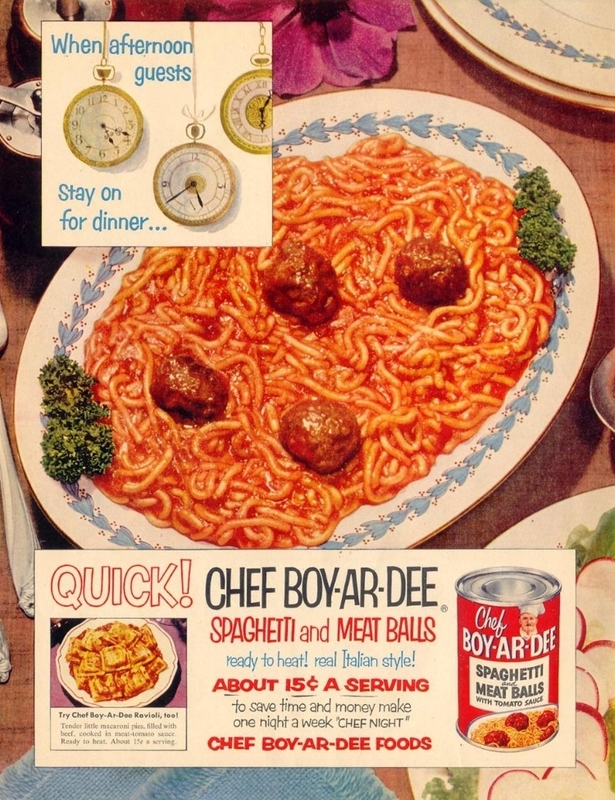 Here are some of my favorite advertisements/recipes (because I realized that no one was shamed to always be selling something in these eras) with their more modern versions today without (as much) lard and sodium. I absolutely love that little proper tuna up top. I want him to tip his hat to me and give me a wink. I think it's been a while since anyone has thought of pairing tuna and soufflé, or maybe savory soufflé in general, but you may be pleaseantly surprised. This Tuna and Celery Soufflé from Bariatric Cookery is the perfect way to amp up a can of tuna. Things that I miss: soda in glass bottles, striped straws, and all of these style of tall glassware. Soda is one thing that has not gone out of style. We've seemed to figure out exactly how bad it is for you, but unfortunately the hasn't stopped anyone. I rarely drink soda, but when I see a cold bottle of it, sometimes I can't resist. This Watermelon Soda Float from Happy & Harried is slightly more healthy with fresh watermelon, lemon juice, vanilla ice cream, and club soda. It makes me aggressively want summer and porch days. And maybe also to be 10 years old in 1955. You see dusty cans of Spam on the back of bodega shelves, but it's not something you usually think of grabbing. I would always cringe at the thought until some friends of mine from the Philippines fried some up with maple syrup and it was eye opening. My favorite breakfast sandwich spot also does a spam, egg, and dijon mustard on an english muffin that is crazy good. I'm sure tossing some Spam in your pancakes would be unreal, but if you want to take it easy on the sodium and whatever else is in that mysterious can, swap for these Bacon Pancakes from Lena's Kitchen. There are a lot of secrets to get the most perfect scrambled eggs, but a lot is simply up to preference. I always add a little bit of water, cook them on low heat and slowly stir them for 10 minutes or so. Apparently Campbell's secret is adding a can of cream of chicken soup, and I'm not totally against this. Serious Eats does an article on the tips and tricks for the best scrambled eggs and you'll learn just about every path you can take with your eggs. They mention different liquid add ins such as cream, milk, stock and dashi. Give each a try and find your favorite. We're trying to take a healthier path on this one, as tempting as it is to use a can of Campbell's salty goodness, you can opt for homemade stock instead. This ad campaign is hilarious. "When afternoon guests stay on for dinner". What kind of guests linger for that long ... AND expect you to make them another meal? Well I guess if you ever find yourself in this odd predicament and you're too embarrassed to tell your guests you haven't been slaving in the kitchen to prepare them an incredible meal then you need to know a super fast spaghetti recipe. Okay, so it's not going to take 3 minutes in the microwave, but to whip up some tasty spaghetti and meatballs in under 30 minutes is still pretty impressive. Sorry Chef Boyardee, it's hard to say no to that mustache but I can do this myself. Smitten Kitchen's Everyday Meatballs are fool proof. First off, why is there lettuce on the outside of the bowl? I hate that styling so much that I love it. Also totally adore the illustrated ingredients to the right. The 50's really loved tuna and peas. I don't blame em' but the Carrousel Salad Bowl is what really caught my eye. It's like mac and cheese meets pasta salad: a cheesy, creamy chilled pasta salad. Very into it. The Novice Chef has a Bacon Ranch Pasta Salad that is close enough to cure the craving. Well if you're makin' doughnuts you better be MAKIN' doughnuts. Go big or go home. There's no way I can pick just one donut recipe so I'll narrow it down to Jernej Kitchen's Doughnuts with Rich Vanilla Cream and Country Cleaver's Blueberry Lemon Glazed Doughnuts. Donal Skehan's Swedish Rice Pudding is one of the best things I've ever had. It's so creamy with the perfect amount of sweetness. But the best part about this dish are the spoonfuls of chilled rice with sprinkled cinnamon, sugar, and whipped cream on the top. Did a double take when I read about that "really cool refresher" cause DAMN that is a genius idea. Well, instead of just tomato juice how about Bloody Mary ice cubes? So many benefits here ... your drink doesn't water down, when you finish your drink you can chew those tasty cubes, more flavor, more spice, the list can go on. Here is my favorite Bloody Mary Recipe from a Cup of Joe- pour some into a couple ice trays and chill in your next drink. The secret here is the olive juice, which I often replace with pickle juice because I'm obsessed. "The 3-lb. or 6 - lb. size is the most economical". Where would you even fit that in your kitchen? And why is nearly every shortening can from the 50's designed to look like a can of paint. Very deceiving. Anyway, we'll never stop loving cupcakes, especially topped with ice cream. The Crafting Foodie, which is a great go to blog for crazy indulgences, has a kickass Ice Cream Sundae Cupcake recipe that is exactly as decadent as it sounds. Oh no - another case of the unplanned party. These pesky guests just come outta nowhere. Lucky for us, Kraft is here to save the day! In this case we'll just focus on cheese in general, sorry processed goop. Mini pizzas are one of my favorite things in this world and you can basically always make them and put whatever your heart desires/whatever is in your fridge on top of them. The Comfort of Cookings Mini Pizza's are the best cause you can throw them together in under 10 minutes. Apparently Polpettoni Saporiti translates to "a tasty meatloaf"... so, pretty basic. But this dish is more specifically individual meatloaves, pounded thin and stuffed with a creamy rice texture. I couldn't find this recipe anywhere so we might have to give Chef Boyardee credit for this one. Either way it is delicious. The Spruce recreated them perfectly with her Palpettoni recipe. I know this might gross some people out, but honestly, this looks so good to me. I'm a sucker for an open faced sandwich doused in sauce. It's messy and delicious. Macheesmo has the right idea with his Reuben Eggs Benedict. The thousand island hollandaise is dangerously good. I mean I would put it on literally anything. Also the ever so classic French Onion Soup, like Half Baked Harvest's recipe with baby potatoes and thick french bread smothered in Gruyere, is on the same track. 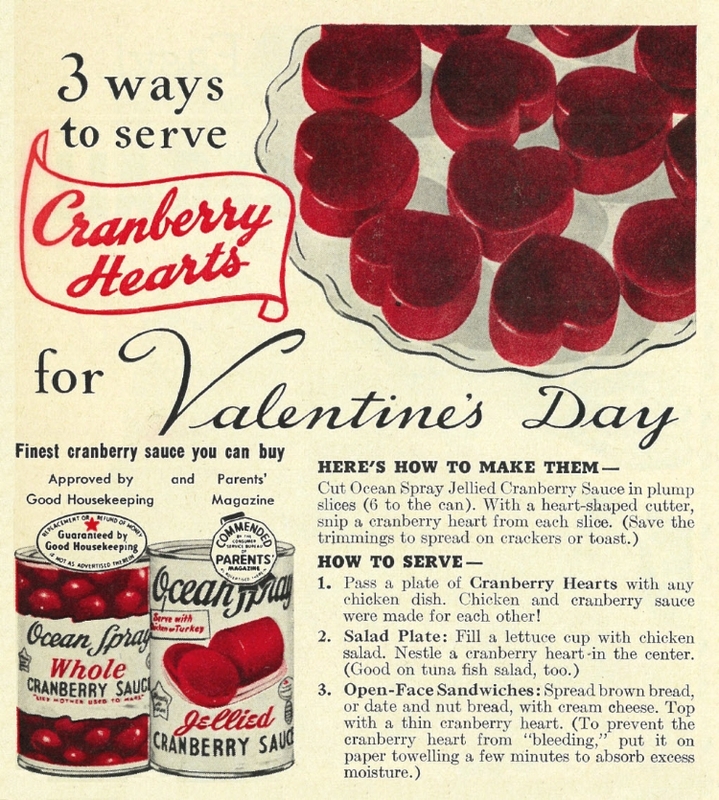 You know how bummed I would be if I bit down on one of these thinking it was candy or chocolate and its jellied cranberry sauce...Just because it's red doesn't mean you should cut hearts out of it and hand over a tray to your crush on Valentine's Day. But their options on how to serve at the bottom of the ad have a little bit more creativity. I could maybe get down with a little lettuce cup of tuna and a cranberry heart garnish. Although taste wise- I'm all for the nut bread topped with cream cheese and cranberry. I used to make jelly and cream cheese roll ups everyday I got home from school while watching Boy Meets World or Sister Sister.